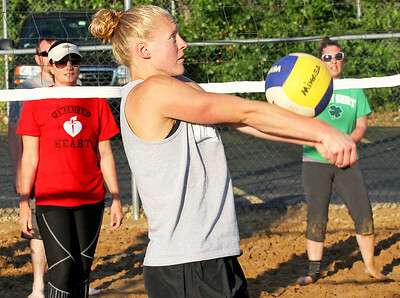 Candace H. Johnson-For Shaw Media Sleepy Jude's Stephanie Schmid, 23, of Lake Zurich bumps the ball against Misbehavin's Lacy Lewis and Carrie Houston, both of Island Lake during the Thursday night coed beach volleyball league at JJ Twigs in Wauconda. 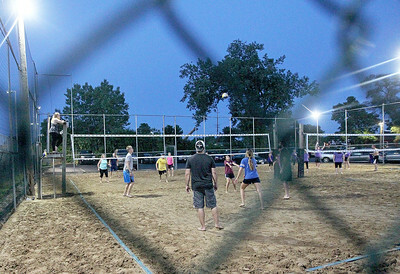 Candace H. Johnson-For Shaw Media Sleepy Jude's Jason Kay, of Round Lake (on right) spikes the ball against the Misbehavin's Greg Jones, of Island Lake during the Thursday night coed beach volleyball league at JJ Twigs in Wauconda. 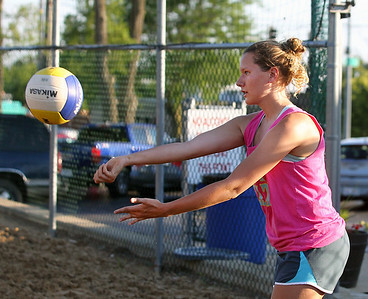 Candace H. Johnson-For Shaw Media Sleepy Jude's Sara Gazdacka, 21, of Lake Zurich serves against Misbehavin during the Thursday night coed beach volleyball league at JJ Twigs in Wauconda. 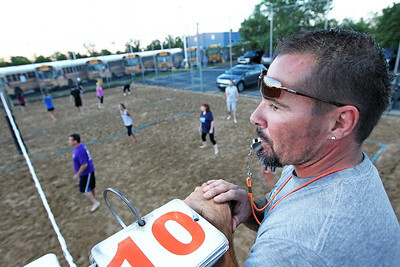 Candace H. Johnson-For Shaw Media Neal Pietrowiak, of Island Lake, league manager, referees for the Thursday night coed beach volleyball league at JJ Twigs in Wauconda. 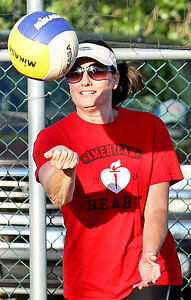 Candace H. Johnson-For Shaw Media Bump Set What plays against the Rubber Mallets team at dusk during the Thursday night coed beach volleyball league at JJ Twigs in Wauconda. 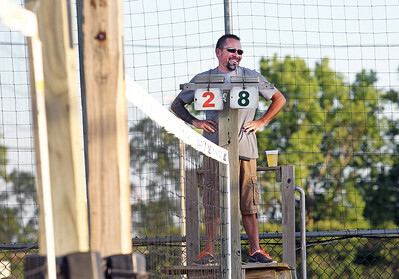 Candace H. Johnson-For Shaw Media Neal Pietrowiak, of Island Lake, league manager, referees the Hit This team against We Need Sets game during the Thursday night beach volleyball coed league at JJ Twigs in Wauconda. 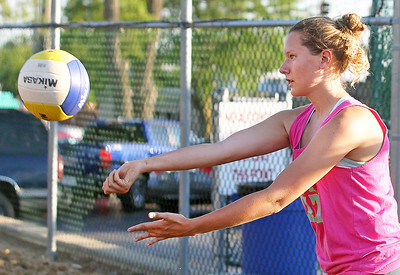 Candace H. Johnson-For Shaw Media Misbehavin's Lacey Lewis, of Island Lake serves against Sleepy Jude during the Thursday night coed beach volleyball recreational league at JJ Twigs in Wauconda. 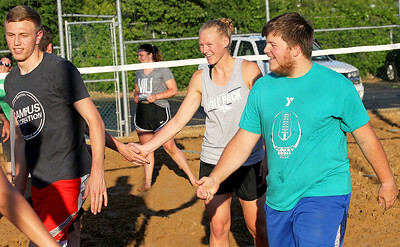 Candace H. Johnson-For Shaw Media Sleepy Jude's Stephanie Schmid and Garold Nellis, both of Lake Zurich, (on right) shake hands with the Sleepy Jude team after one of their games during the Thursday night coed beach volleyball league at JJ Twigs in Wauconda. Candace H. Johnson-For Shaw Media Misbehavin's Greg Jones, of Island Lake looks to block a spike by Sleepy Jude's Jason Kaye, of Round Lake during the Thursday night coed beach volleyball league at JJ Twigs in Wauconda. 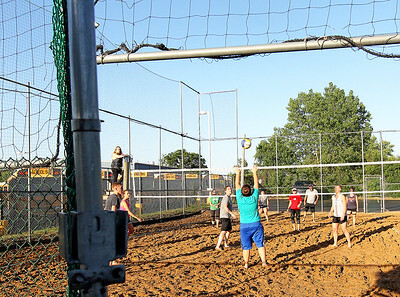 Candace H. Johnson-For Shaw Media The Sleepy Jude coed volleyball team takes control of the ball as they play against Misbehavin during the Thursday night beach volleyball league at JJ Twigs in Wauconda. 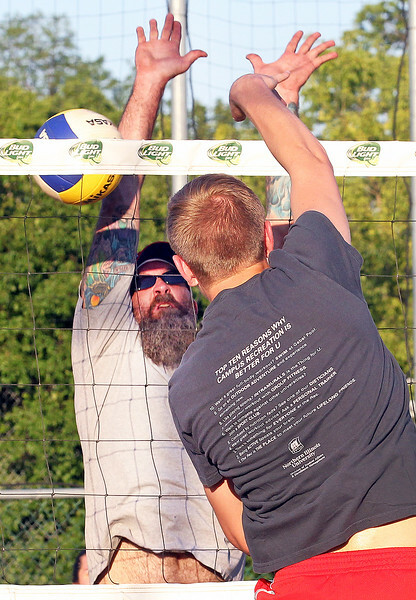 Misbehavin's Greg Jones, of Island Lake looks to block a spike by Sleepy Jude's Jason Kaye, of Round Lake during the Thursday night coed beach volleyball league at JJ Twigs in Wauconda.